Ghostwalker Tours has the Experienced Guide. Advance purchase required! Save yourself from the Groupon Tour Crowd of 30-60 drunks – remember, you get what you pay for! My name is Patrick and I am one of “The Ghostwalkers”. I’ve been conducting ghost walking tours in the City of Savannah since 1995. I’m very good at what I do. 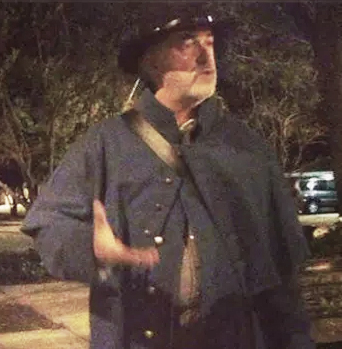 I have the confidence to tell you that I am one of the best History and Ghost Tour Guides in Savannah GA, and with the most experience – over 20 haunting years. If you want a cheesy Ghost Tour to kill an hour and a half of your time while in Savannah, go take a Trolley ride. If you want an unforgettable, lifetime experience you can tell your friends back home about; come walk with me and 15 like minded individuals while hunting for Paranormal Activity! You can use our K2 EMF meters and be a “Ghost Hunter”. Don’t unknowingly get packed into a tour with a mob of 30 or 60 drunks. If you call somebody else advertising GROUPON rates, they are going to do that to you!! My tour is semi-private; “Limited to the first 15” that make a reservation. My tour is a nice “walk about” without the drunken pub crawl crowd, fussy tired babies, or the fumes from some toxic trolley blowing in on you through their open windows while they sit in traffic and idle with you on board. DON’T GET PACKED INTO A SARDINE CAN! If you want to end up in the back of a 60 plus Trolley ghost tour, where you can’t hear the tour guides narration over the roar of an engine, call Old Towne Trolley or Old Savannah Tours . They love to pack you in…… like sardines in a can. Big groups mean big profits for them! They don’t care about you enjoying your once in a lifetime visit to Savannah. Come on, it’s your vacation. Step-up and treat yourself to a Ghostwalker Tour and learn something about Savannah while you’re here and enjoy it while doing it! A guest once told me: “Patrick, taking the trolley tour was like going to the movie. Taking your walking tour was like reading the novel“. 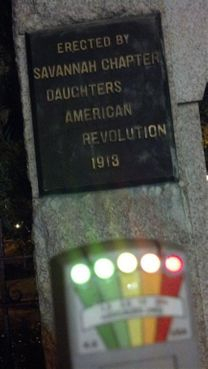 Save yourself by taking my ghost tour; hear the telling of the Savannah History and Ghost Stories! 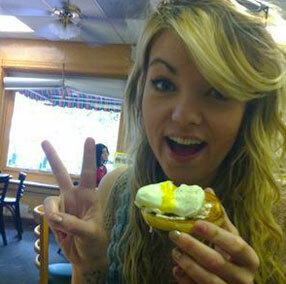 Then go and treat yourself to a good breakfast the next morning at Clary’s Cafe. It’s where the locals eat and gossip about last night in Savannah! See you there! With our Savannah Ghost tours, every night is a Live Performance, where I lead you down the dark and creepy halls of history and introduce you to those that have gone on before us and “crossed over”. Take my tour and hear The Savannah Ghost Story. Immerse yourself in the ambiance of the historic district and your footsteps will become a part of our history. You may find yourself wanting to remain here “Forever”. I took the Ghostwalker Tour last night and had breakfast at Clary’s Café ! I missed it, and we all know what happened to me! Don’t YOU miss it! Book Now!